The game was inspired by pinball, and it challenges players to fling Red around the playing field to rescue eggs. Ahead of the release of The Angry Birds Movie in theaters in May, Rovio released Angry Birds Action on mobile. Developed by Tag Games, the game was inspired by pinball, and it challenges players to fling birds around the playing field to complete goals. In each level of Angry Birds Action, players drag their finger on the screen to aim their shot and lift their finger to fire. After a bird is released, it runs around the board, bouncing off obstacles and destroying objects in its path until it comes to a stop. Levels may contain more than one board, each with its own goal to complete. These goals may challenge players to rescue eggs by knocking down the pillars holding them up or collect candy pieces by running into them. Players can use a limited number of birds to clear each board, but a single bird can be used for multiple shots before it leaves the screen. Gamers begin with Red, but they will unlock additional birds over time, each with a different skill. Bomb, for instance, triggers a blast when he’s first launched into an object. Players earn up to three stars on each stage, depending on their score, and they can open up to three treasure chests after each level, depending on the number of stars they earned. These chests contain prizes such as coins and power-ups that can be used in future levels. One power-up, for instance, temporarily allows a bird to pick up speed as it bounces off of objects on the board. Once The Angry Birds Movie launches in theaters, viewers can unlock a bonus scene from the film, as well as a separate Piggy Island of content, by taking their device to the movie and allowing Angry Birds Action to “listen” to the film during its end credits. In addition, Rovio partnered with augmented reality company Zappar to allow users to play augmented reality mini-games within Angry Birds Action by interacting with branded objects in the real world. Specifically, players can scan BirdCodes printed on products at locations such as McDonald’s, Walmart and H&M to unlock new content within the game. For instance, players will be able to scan a BirdCode on a McDonald’s Happy Meal box to play a “Whack-a-Pig” mini-game, while scanning a BirdCode on an Angry Birds Movie PEZ dispenser will allow users to shoot virtual PEZ candies at pigs, and so on. More than two dozen different BirdCode experiences have been created for players to try. Users may receive free in-game rewards after they’ve scanned a code. We have put the Angry Birds characters and story at the center of a truly 360-degree experience this summer, bringing the story world to life in a new way both for our heavily engaged fanbase and newcomers alike. Angry Birds Action is the cornerstone of our comprehensive digital movie program, which bridges digital and physical entertainment like never before, and with more than 1 billion BirdCodes to be found out in the wild, at a scale never seen before either. 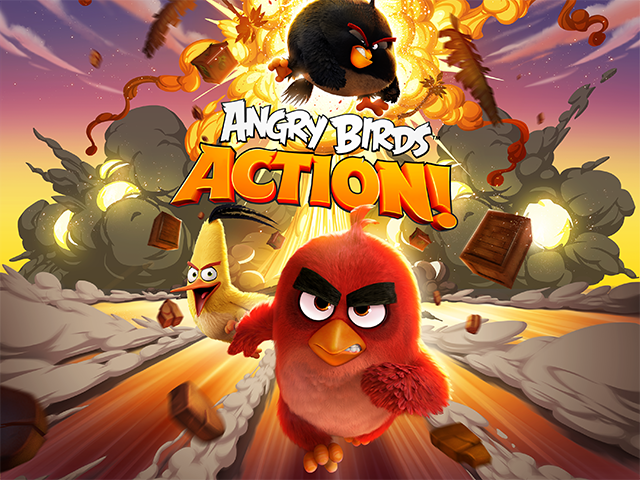 Angry Birds Action is available to download for free on the iTunes App Store and Google Play.